Lihaga Island Is a Hidden Paradise in North Minahasa - Lihaga Island is one of the most beautiful islands in Indonesia, located on the northern tip of Sulawesi Island or precisely located in Likupang Barat District, North Minahasa Regency, North Sulawesi Province, Indonesia. This small and beautiful island of 8 hectares is like a paradise hidden between Gangga Island and Siladen Island. Because tourists still rarely come to visit, the atmosphere on Lihaga Island feels so natural like a private island. The white sand stretch of the beach is in stark contrast to the green color of shady trees and shrubs in the middle of the island. 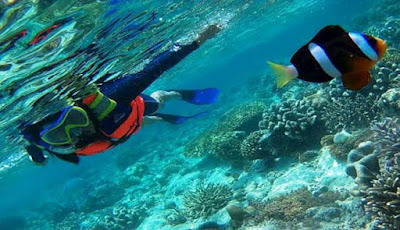 Mounds of coral and colorful fish look very clear from the clear waters that make you feel at home for a long holiday to this beautiful island. On this uninhabited island, you can enjoy the beautiful underwater panorama with swimming, snorkeling, diving and sunbathing. Underwater scenery on Lihaga Island is as beautiful as the Bunaken Marine Park which is famous for its beauty. Although the island is uninhabited, you don't need to worry because there are toilets and changing rooms available on this island. Even the island also has a large wooden building. 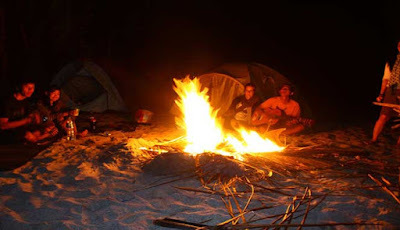 Although there are no inns, you can spend the night on Lihaga Island by carrying your own tent. In addition, if you want to vacation on Lihaga Island, do not forget to bring your own food and drinks to taste because on Lihaga Island there are no stalls selling food or drinks. 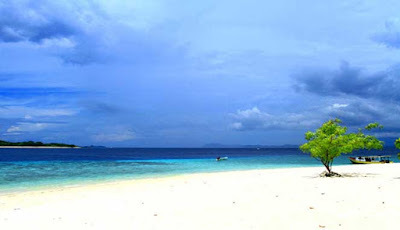 Even so, Lihaga Island is one of North Minahasa Regency's Favorite Destinations. This island is a favorite location for many photographers to capture the beauty of the Hidden Paradise of Lihaga Island in North Minahasa. So besides preparing equipment for overnight, food and drinks, also prepare a camera to capture the beauty of this very charming Lihaga Beach. Walking around the island while looking for the best spot for selfies is another exciting activity you can do on this island. On one side of the beach, there is an interesting spot where several large hard corals are stuck up on a soft stretch of white sand beach. Another interesting selfie spot is backing Gangga Island. This is where you can wait for sunrise and sunset. 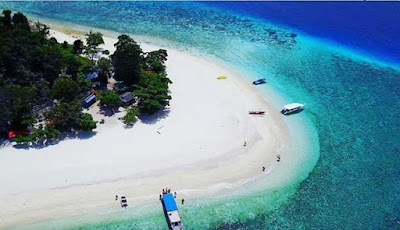 Lihaga Island can be accessed from the city of Manado by land transportation to Serei Port in Likupang Timur with a travel time of about 1.5 hours. From this port the journey continues by using a fishing boat to Lihaga Island with a travel time of about 45 minutes.